Located at the confines of Hesse, Aschaffenburg possesses one compelling attraction, the imposing Schloss Johannisburg, standing proudly at the heart of the city. For 200 years it served as the second residence of the Prince-Bishops of Mainz, and is one of the great Renaissance castles in Germany. Unfortunately the castle was badly damaged by Allied bombings at the end of WWII and very little remains of the original interior. The castle now houses a small museum showing scaled reproductions of ancient Greek and Roman temples and other constructions, as well as a few pieces of modern art. Don't expect to find beautifully moulded ceilings, ancient parquet flooring, tapestries on walls or other precious artefacts. There is nothing left of the grand stately home of the Prince-Bishops. 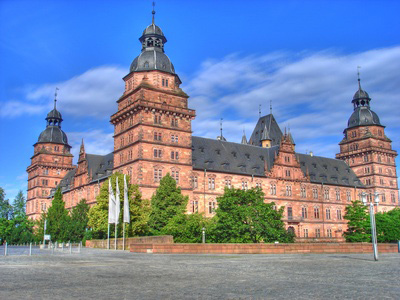 The massive, well restored edifice is nevertheless well worth a look and Aschaffenburg deserves a stop on your way between Frankfurt and Würzburg or Bamberg. The castle is open from 9:00 am to 6:00 pm, daily (except Mondays) from April to September, and from 10:00 am to 4:00 pm the rest of the year. The annual closing days are 24th, 25th and 31st December and 1st January. Admission costs 5.5 € for adults and 4.5 € for concessions, and free for children until 18 years old.